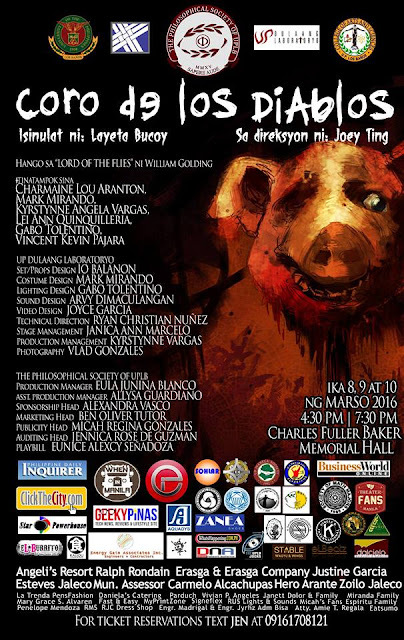 After its successful run at the University of the Philippines last September 2015, Dulaang Laboratoryo’s Coro De Los Diablos is set to be staged this time at the University of the Philippines Los Baños in Laguna on March 8, 9 and 10 with 4:30pm and 7:30pm performances at the historic Charles Fuller Baker Memorial Hall. Award-winning playwright Layeta Bucoy has adapted into Filipino the celebrated classic novel of William Golding's Lord of the Flies. Coro De Los Diablos is a tragic drama that explores human survival. Six teenagers along with those who did not survive are about to attend the World Youth Convention. Their plane crashes on an unidentified island where each character discovers and confronts their true selves. The adaptation is set during World War III. It features Charmaine Lou Aranton (Pat), Mark Mirando (Jules), Vincent Kevin Pajara (Migs), Lei Ann Quinquileria (Donna), Christian Gabriel Tolentino (Sam) and Kyrstynne Vargas (Girlie). Theater, TV and film director Joey Ting directs and supervises the artistic and production team: Io Balanon (set), Mark Mirando (costumes), Arvy Dimaculungan (music and sound), Joyce Garcia (video), Gabo Tolentino (lights) and Ryan Christian Nuñez (technical direction). This theatrical event is made possible with the generous support of UPLB Philosophical Society in celebration of their first anniversary. Organizers are Eula Junina Blanco (production head) along with Allysa Guardiano, Alexandra Vasco, Ben Oliver Tutor, Micah Regina Gonzales and Eunice Alexcy Señadoza together with their chief archon Jennica Rose De Guzman and their faculty adviser Prof. Nikulous Aranas. Tickets are P150.00. For reservation, booking and inquiries, contact 0915-4509432.